Winter is in full effect here in Kansas City, which means we’re in for months of frigid temperatures, ice-cold winds, blowing snow, and icy surfaces. Unfortunately, this can mean a lot less time spent outdoors and a lot more time stuck inside. While some people prefer this, it’s harder for dog parents and their furry best friends to stay cooped up indoors all winter. Dogs are active creatures by nature and their whole well-being thrives on being active and moving. When our canine companions have to stay inside and largely inactive when it’s cold, this can affect their physical and emotional wellness, leading to weight gain, muscle and joint stiffness, behavioral issues, and even depression. 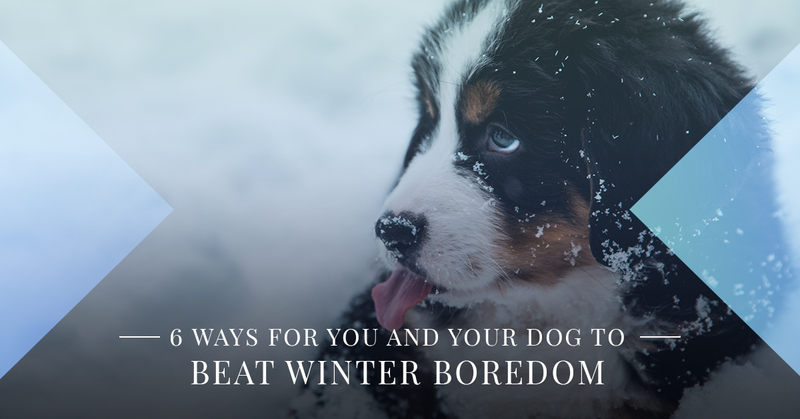 So, what can you as a dog parent do to beat the wintertime boredom? At Eagle Animal Hospital and Pet Resort, we want your dog to stay healthy, happy, and active — even during the cold, gloomy months. Today, our team will share some helpful hints for beating winter boredom and inactivity, so that your dog (and you) can keep moving and stay engaged all winter long. Call or click to find out more about our doggy daycare and dog boarding near you in Riverside! Even when it’s cold and snowy outside, it’s important to maintain your dog’s walking routine. They need to get plenty of exercises every day, and walking them — even if only for 20 minutes — is a great way to keep their heart rate going, their mind engaged, and their muscles and joints strong and flexible. If you’re worried about slick surfaces or ice melt that could potentially irritate their paws, look into dog boots. These protect their pads from icy surfaces that could injure them or the skin between their toes. If you’re worried about the cold temperatures, long-haired breeds typically do fine in the winter, but short-haired breeds could use some extra warmth. Try out a comfy dog coat! These are designed to keep them warm and protected from the elements while giving them plenty of wiggle room to walk, run, and play. Dog parks are great places for dogs to socialize with other pups. Plus, they can run hard, play hard, smell interesting scents, and just be, well, a dog. It’s a good idea to bring a tennis ball launcher or frisbee, just in case there aren’t other dogs there. That way, they can still play fetch, which can boost their mood and give them plenty of exercise for the day. Keeping plenty of interactive dog toys on hand is great anytime, but especially during winter. Puzzle toys and treat-dispensing toys are designed to keep your dog’s mind and body active. Plus, they provide excellent in-the-house entertainment on those days when it’s simply too cold to go play at the park. Squeaky fetch toys are perfect for playing in the snow in the backyard or at the park and provide a means for owner/dog interaction and play. Take your dog to doggy daycare once or twice a week. This gives them the opportunity to play and socialize with other dogs in their age group, in a safe, supervised environment. Not only will they be active and engaged, but they can also develop good behavioral skills as they familiarize themselves with other dogs and other humans. Sometimes, it’s nice to get away from everything for a few days. A winter trip out of Kansas City is a great way to escape the frigid Midwest cold for a few days. Plan a quick road trip for you and your dog. Go someplace warmer or somewhere that doesn’t get as much snow as we typically do this time of year. Places like Texas, New Mexico, and Arizona are within driving distance and make for a nice weekend getaway. While these places typically get rain and/or snow this time of year, it’s not nearly as bad as we get it here in KC. Another option is to take a trip to a warmer region of the country during the winter. The only problem is, it’s not as quick of a drive, which means you’ll likely have to fly. In this case, pet boarding for your dog is an excellent option. Rather than searching “dog boarding near me,” simply call our Kansas City pet resort and book a stay for your dog in our fun and cozy, state-of-the-art dog boarding facility. Here, your precious pup can frolic, play, and socialize with other dogs in our indoor and outdoor dog runs. This will keep them active and engaged while you’re getting a well-deserved break from the cold. Call Eagle Animal Hospital and Pet Resort to book a suite for your dog while you travel. We’ll care for your special family member just like our own.